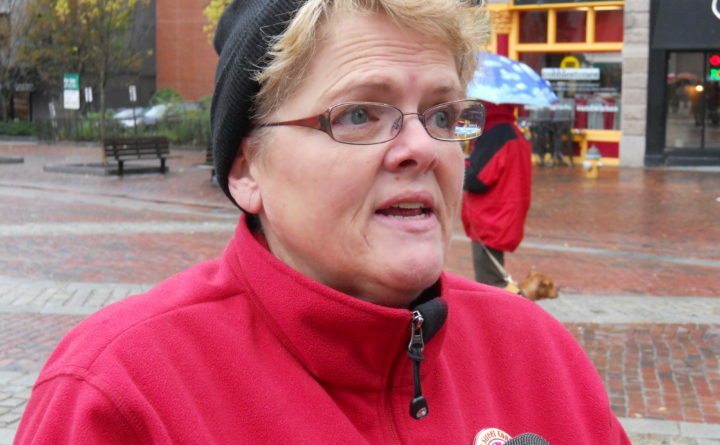 Cokie Giles, president of the board of the Maine State Nurses Association, fields questions from reporters in this BDN file photo. Still under pressure from an unpopular decision last year to discontinue labor and delivery services, Calais Regional Hospital will “suspend” certain outpatient cancer care services, including intravenous chemotherapy infusions, beginning May 1. In a news release sent Wednesday afternoon, the hospital said services provided in its “Rose Room” infusion center are not financially sustainable due to low patient demand and the high cost of medications, staffing, supplies and overhead. With an average of only 1.4 patients per day for the last two fiscal quarters and “extremely low cash on hand,” the hospital can’t afford to “shuffle the costs around while waiting for reimbursement,” the release said. The decision will be reviewed in the fall, according to the statement. The Maine State Nurses Association, representing unionized nurses in Maine, fired off its own news release earlier in the day, condemning the decision and calling for the hospital board to “sever ties” with Quorum Health Resources, the Tennessee-based for-profit company that manages it. Quorum provides management services for three Maine hospitals: Calais Regional Hospital, Cary Medical Center in Caribou and Penobscot Valley Hospital in Lincoln. In a similar decision announced a year ago, Calais Regional Hospital discontinued labor and delivery services, forcing women to travel 40 miles or farther to deliver their babies at other hospitals. At the time, the hospital said it could no longer afford to provide the expensive specialty service due to low demand in the aging and sparsely settled region it serves. The Maine Hospital Association has warned that rural hospitals across the state are being forced by rising costs, falling populations and inadequate reimbursements from Medicaid and Medicare to carefully consider which services they can provide to the communities they serve. But the nurses’ association, local residents and some lawmakers argue that Maine’s nonprofit hospitals should be answerable to their communities and seek public input before making cuts in care. In response to public outcry over last year’s elimination of labor and delivery services, the Calais hospital has tried to work more closely with members of the City Council and others in the community to keep them apprised of its financial challenges, hospital spokeswoman Dee Dee Travis said in an email, including the possibility of eliminating services. In its statement, Calais Regional Hospital said its leadership looks for “all opportunities, large and small” to lower operating costs and improve its financial outlook, including decreasing staff and management costs and streamlining purchasing and billing operations, in addition to eliminating unsustainable services.